The government will today send to the United Nations Human Rights Council (UNHRC) a document outlining its performance in areas of international concern to be taken up at the Universal Periodic Review (UPR) next month in Geneva, it is learnt. The UPR is a process of evaluating the human rights records of member countries once in four years. It provides an opportunity for all countries to report on the action taken by them to improve human rights and overcome challenges to the enjoyment of human rights. Sri Lanka’s situation was evaluated at the 2008 UPR where some members of the international community raised issues with regard to the human rights situation. The External Affairs Ministry has completed its response to be considered at the September UPR in Geneva. When asked about the upcoming UPR, External Affairs Minister G.L. Peiris said Sri Lanka’s UPR document would be sent today. However, he declined to give further details about the matters outlined in it. The UNHRC also adopted a resolution against Sri Lanka in March, urging the Sri Lankan government to address accountability issues during the last stages of the war and to implement recommendations by the Lessons Learnt and Reconciliation Commission (LLRC). The government has already prepared a national action plan to implement these recommendations. As a prelude to the Washington meeting between US Secretary of State Hilary Clinton and Sri Lanka External Affairs Minister Prof. G.L. Pieris on 18 May surrounding the issues of the implementation of the recommendations of the reconciliation commission, accountability to alleged violations of international law during the final chapter of the battle to defeat separatist Tamil Tigers and ethnic reconciliation, a senior American diplomat stationed in Colombo sent a serious message to Sri Lanka.The United States encourages a political package that will address the root cause of the 26-year conflict; it envisages a fresh dialogue between the GSL and the main Tamil political party TNA; the US guarantees that the TNA and other Tamil political parties now committed to a ‘United Sri Lanka’; the vitality of an ‘action plan’ to address the alleged violation of international humanitarian law, accountability and the implementation of the LLRC recommendations; the importance of addressing the grievances of the Tamils in Sri Lanka. Dr. Paul M. Carter, the Political Counselor of the American Embassy in Sri Lanka, the third ranking US foreign service officer of the State Department in Colombo, made known to the Government of Sri Lanka what the United States expect of Sri Lanka when Minister Piers visits Washington this week when he addressed a seminar convened by a Tamil National Alliance parliamentarian S. Sritharan in Jaffna on Sunday, 13 May. In fact, it is Dr. Carter’s unit in the Colombo US mission, the Political Section, that monitors, researches, investigates and come up with policy planks on Sri Lanka’s ‘National Question’ for the understanding and consumption of the Secretary Clinton’s office through the South and Central Asian Bureau of the State Department. The tone of his address and issues highlighted to the Jaffna gathering, which was attended by the Indian Deputy high Commissioner stationed in Jaffna V. Mahalingam, is the indication the basis of the talks Ms. Clinton will initiate this Friday with Dr. Pieris in Washington. We give here the section of American Embassy Political Counselor’s address on the issues that are on the Clinton-Pieris agenda in Washington. (Begin Text) The Government of Sri Lanka has taken extraordinary and excellent measures to economically rebuild the war-ravaged north and east which is highly commendable. Less have been done however on the core political issues of accountability, reconciliation and finding a political solution with the elected representatives of the Tamil People. We believe that while economic growth is important, lasting peace addresses the issues that led to the conflict. Indeed, studies by experts on conflict resolution around the world indicate that if the underline causes of the conflict are not addressed there is a high risk that in several years a new conflict could result. This is the message not only of the United States and the international community, many Sri Lankans have made the same argument. President Rajapaksa appointed the Lessons Learnt and Reconciliation Commission (LLRC) to look into these questions. The US gave the LLRC time and space for its work, and it did nit pre-judge the commission. The LLRC completed its report and sent it to President Rajapaksa in November. And, in December the president sent the report to the parliament and was made public. We read the report with great interest. The LLRC report addressed a large number of areas that concerned to Sri Lankans. It made substantive recommendations on reconciliation, rule of law, media freedom, disappearances, and human rights violations and abuses. If implemented, these recommendations could contribute to genuine reconciliation, and strengthen democratic institutions and practices. At the same time the report’s conclusions on accountability, the alleged violations of International humanitarian Law (IHL) and International Human Rights Law (IHRL) were not strong. And, these were shortcomings in the accountability sector. The LLRC also came to the significant conclusion that the cause of the war the failure of the Sri Lankan governments’ over the years to address the grievances of the Tamil people. None of these conclusions of the recommendations came as a real surprise. The LLRC hearings were mostly public and people raised these issues in their testimonies. These are well known issues. Particularly very human issues such as disappearances, families not knowing where their loved ones are, and people wanting to obtain death certificates for the family members they knew were dead. And, people wanted to go back to their villages. Thus, we do not agree with those who say that it is only being a short time the LLRC report was published. Or, the idea that it is too early to expect the government to have an action plan in implementing the findings of the LLRC recommendations. Given the lack of action to implement the recommendations of the LLRC, the U.S. and 39 other countries sponsored a resolution on reconciliation and accountability in Sri Lanka in the UN Human Rights Council in Geneva in March. Much was said in the Sri Lankan press about the resolution; unfortunately, much of it is not true. First, it called on the GSL to implement the constructive recommendations made by the LLRC, and to fulfill its legal obligations and commitments to initiate credible and independent actions to ensure justice, equality, accountability and reconciliation to all Sri Lankans. Second, it requested the GSL to present as quickly as possible a comprehensive action plan. This plan should detail the steps that the GSL has taken and would take to implement the recommendations, and also to address the alleged violations of international law. Third, it encouraged the Office of the UN High Commissioner for Human Rights to encourage them to provide in consultation with and with the concurrence of the GSL advise and technical assistance to implement the above steps. It also requested the HR Office to present a report on the provision of the assistance to the HR Council in March 2013. We are waiting to hear the GSL plan on the implementation of the LLRC recommendations. This week, Minister of External Affairs G.L.Pieris travels to the U.S. to meet Secretary of State Hilary Clinton and other officials of our government. Secretary Clinton will ask about the GSL action plan and progress in implementing the LLRC recommendations as discussed in the UN resolution. In addition to the LLRC report and its recommendations, the U.S. has closely followed the bilateral talks between the GSL and the Tamil National Alliance (TNA) on political settlement. We believe that dialogue and negotiations are essential in reaching an agreement that is in the best interest of all sides. We therefore, were disappointed when the talks came to a standstil in January. Now it appears that the talks in current configuration may not continue. Nevertheless, the TNA leadership has said that with certain conditions the TNA would be willing to enter the parliamentary select committee (PSC). We support the decision of the TNA, and will do what we can to encourage all sides to work in good faith for the PSC to reach an equitable and sustainable agreement in a timely manner. An agreement will require a dialogue and compromise from all involved. It also will require all parties to work together as statesmen. This is the test of a true democracy whether politicians could work together in the best interest of all the people. Sri Lankans suffered greatly in the war. It is our hope from that suffering and disruption the emergence of new appreciation of and commitment to peaceful political dialogue. The TNA and others recognize the future of the Tamil people is to be found in united Sri Lanka that respect the rights of all its citizens. We will continue to support the efforts of Sri Lankans to find a peaceful political settlement. Last afternoon, the Minister of External Affairs, Professor G. L. Peiris was a guest speaker at the Woodrow Wilson Center for Scholars in Washington DC, a stone’s throw from the White House on Pennsylvania Avenue. The Center, named after the 28th President of the United States was a great venue for the Minister’s lecture on the topic: “ Sri Lanka: Challenges and Opportunities” because the Center is a non-political, non-partisan entity which gives a platform for scholars to analyze and dissect political situations in an academic environment. 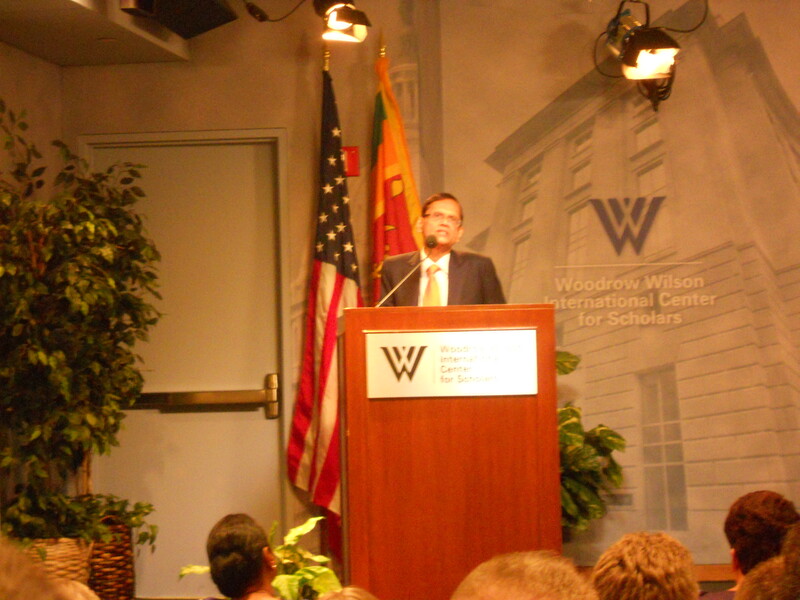 Mr. Robert Hathaway, presided over the event and introduced Professor Peiris as someone similar to President Wilson. He drew parallels between President Woodrow Wilson and the Minister by pointing out they were both scholars and statesmen. Like the President, Professor Peiris had abandoned his academic life to take up politics. During his address, the Minister focused first on a short outline of the conflict, and then moved on to the Government’s vision for the future: the process of reconciliation and a transformation from terrorism to tranquility. He outlined the challenges that had to be overcome during the past three years, and noted the social and economic progress taking place today. He emphasized the importance of identifying those challenges, prioritizing them and using effective modalities for solving those problems. He further stated that economic development is a viable part of reconciliation. The economic growth of the North is 22% as compared to 8% in the rest of the country. “The economic revival of the North is a priority of the Government” he said and fisheries, agriculture and industries have been important components of this revival. Professor Peiris, being an academic, spoke on the difficulties in the field of education and proposed bilingual or trilingual education for children in Sri Lanka. He said that lack of communication is a great hindrance to understanding and reconciliation between communities in Sri Lanka. Professor Peiris stressed the Government’s spirit of inclusivity and common resolve to move the country forward. He stressed that President Mahinda Rajapaksa is committed to implementing the LLRC recommendations in an organized, deliberate way unhindered by foreign intervention. In answer to a question at the end of his address, Professor Peiris remarked that the US and Sri Lanka had more points of agreement than disagreements and both countries have a common goal of peace for all citizens in Sri Lanka. The Minister of External Affairs, Professor G. L. Peiris will be in the US for several days beginning May 14 for talks with the US Secretary of State, Hillary Clinton, Members of the US Congress, and several other politicians . He will speak at the Woodrow Wilson Center in Washington DC on Tuesday, May 15 from 3:00 to 4:30 pm. Many Sri Lankan expatriates living in the DC area are expected to attend the public lecture. News coming out of Sri Lanka about the Government’s decision to implement the LLRC recommendation of releasing the names of war detainees comes at a very opportune time. Even though the names will only be released to close relatives, this is a step in the right direction, since it was a thorn on the side of Tamil politicians and a major propaganda tool for the Pro-LTTE Diaspora.